Embroidered V-cuff Renaissance Stocking with unique gold and red ribbon. Made of velvet and organza material. The cuff is trimmed with ribbon and beautiful beaded tassels. Lined with soft polyester. So very elegant stocking. Names can be personalized on the cuff of this Christmas stocking with GOLD metallic embroidery thread. 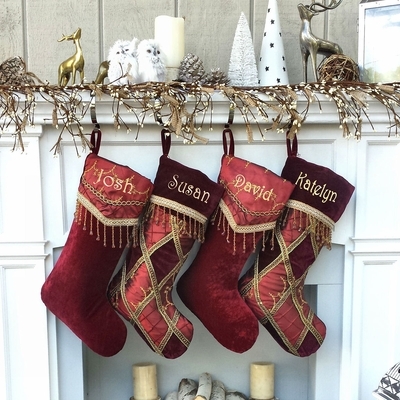 We have a sample picture of the stocking monogrammed with metallic embroidery thread ... click on the thumbnail image in the top right hand corner of this page to see a larger version. Measurements: The stocking is plenty big, about 19 inches diagonally and 8" wide. Materials: The stocking is made from red velvet and organza. The cuff is trimmed with elegant gold ribbon and beaded tassels. Lining: This stocking is lined inside with soft red polyester.